But before you go on a shopping spree for new hangers and containers, hear out Lisa Adams, CEO of L.A. 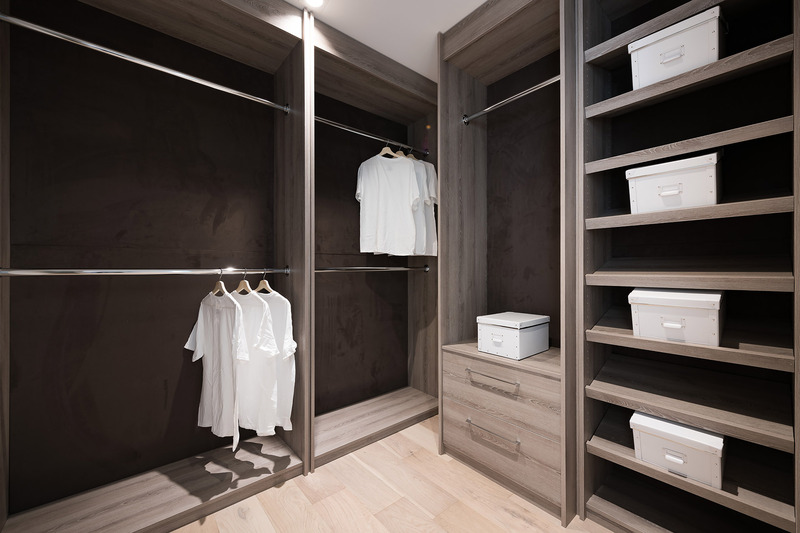 Closet Design, “Keep everything organized by category and color, similar to the way you would find clothing items displayed in a boutique,” she says. So that means don’t go stuffing purses in a drawer — set them out on open shelves and surfaces where you can see them every time you visit your closet. “If you see everything you have, you’ll wear everything,” Adams points out. Located in El Niguel Heights, this remodeled home was rebuilt by renowned builder Chris Dyer, designed by Michael Bryan Interiors, with stonework by Concept Studio and the award-winning landscape designer Ruben Flores of Visionscape. 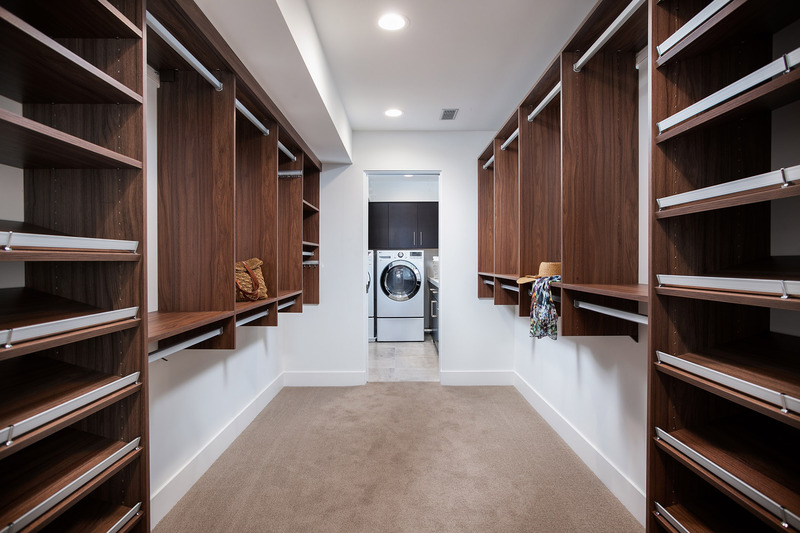 Inside this beautiful home, you will find an incredible walk-in closet, complete with skylights and a window for plenty of natural light, and most importantly, an abundance of shoe storage. This completely-rebuilt single-level home exudes soft contemporary indoor/outdoor details with no expense spared. Inside the gorgeous home, you will find the master suite, which provides a perfect relaxing retreat including a large built-in closet, soaking tub, double vanities, dressing table, and an oversized shower. 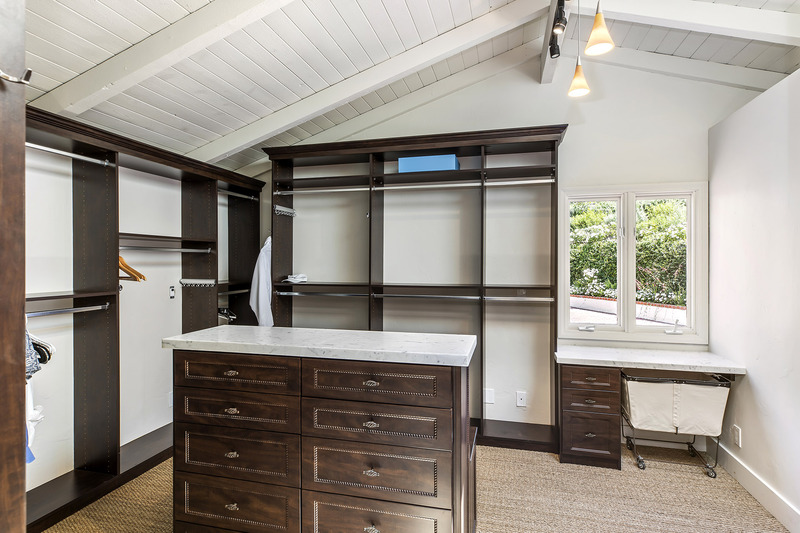 This walk-in closet features built-in lighting, ventilation, beautiful wood flooring, and adjustable rods and shelving, to provide a completely custom layout to fit exactly what you need. Nestled in the hills of prestigious Monarch Bay Terrace in Dana Point, this masterpiece awaits the most discerning audience. Completed with only the highest end finishes and craftsmanship, the whole home features custom, high-end appointments throughout. Within the home, you will find the master bedroom, which features exceptional ocean views and an expansive master bath complete with over-sized soaker tub within the marble-lined shower, a private patio, and last but not least, a custom walk-in closet with beautiful built-in shelving, drawers, and clothing rods. This recently remodeled home in the exclusive gated community of Three Arch Bay features panoramic, 180-degree white water ocean views, letting in an abundance of natural light. Within this incredible home, the expansive master retreat features a large ensuite bath, separate access to the courtyard, and an enormous walk-in closet including an closet island with built-in storage, adding a unique touch and welcome addition to the already-impressive walk-in closet. This contemporary, newly constructed home offers luxury beach living with four bedrooms, four baths, rooftop deck, and a bonus room. The master suite is the perfect retreat with vaulted ceilings, an abundance of natural light and an incredible bath with custom stonework, and an oversized walk-in closet with enviable built-in space for folded clothes, hanging clothes, purses, and an obviously-important feature: dual shoe racks. This home is a contemporary architectural masterpiece combining concrete, glass, and wide-open spaces with direct access to the Pacific Ocean. Views impress at each level, culminating on the rooftop deck where a 360-degree perspective of ocean and city lights await, along with a spa, fire table, and audio. Designed by Abramson Teiger and built by Gallo Corp, this home won the 2004 AIA OC Chapter Award of Merit. The spacious master retreat features a sitting area, fireplace, private deck, auto shades, walk-in closet, shower, tub, and steam shower. 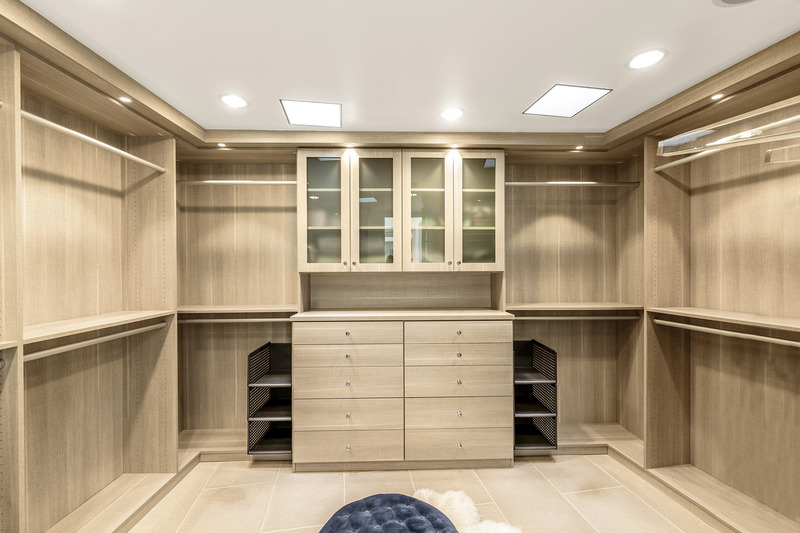 With wall-to-wall storage ranging from clothes rods to accessory drawers, shoe storage, and clear glass-front cabinets, the walk-in closet in this award-winning home is sure to impress even the most discerning clientele. Feeling inspired yet? Maybe all your closet needs is a fresh layout… and a few new pairs of shoes never hurt anyone. Happy shopping and organizing!